In follow up to my earlier post, my research has revealed that I am, happily, wrong about the flat overhand. I made a mistake in my recent book, Advanced Rock Climbing: Expert Skills and Techniques and propagated the mistake in my recent post (below) on the flat overhand (AKA, wrongly, the Euro Death Knot). At the time of publication of the book, I received information from a reliable source about an accident that led me to believe that the knot should not be used. This, however was a misunderstanding of an accident and how some guiding organizations are looking at the flat overhand knot as a result of the accident. I talked to an Austrian guide who clarified the situation nicely, as well as explained the fatal accident involving the flat overhand knot. The bad news, is that the knot (which was only partially tied) securing the ends of the two rappel ropes together did fail, resulting in an accident. The good news, for those of us who have trusted our lives to the flat overhand, is that the investigation that followed revealed that the knot that failed had not been completely tied, so the accident was a result of human error in the tying of the knot, and was not due to the failure of a correctly tied flat overhand knot. The flat overhand can be relied upon and is still taught as a reliable knot by the Austrian, Canadian and American guiding associations as well as others. The American Mountain Guide Association recommends that the flat overhand may not be the best choice in certain situations, such as when connecting a specialized tag line to a regular dynamic lead rope. The flat overhand has been tested to be reliable with ropes of different diameter such as with a 9.5 single lead rope and a 6mm haul line. The Association of Canadian Mountain Guides is now teaching the barrel knot (shown below) as a replacement for the flat overhand for situations where the flat overhand is determined to be inadequate but the benefits of a “flat” profile are needed. Testing by the Deutscher Sicherheitkreis of the German Alpine Club determined that the flat overhand rolls at about 3kN, or about 675 pounds of force. Other testing has shown that after rolling once or twice, the knot eventually fails due to rope breakage at about 30% of the weakest rope in the knot. When rappelling on 2 strands as usual, the force on the knot is halved, so a single rappeller with both strands threaded in their rappel device would have to generate about 6kN to cause the knot to roll. The flat figure eight knot – shown here, is a “death knot” and has caused accidents. The flat figure eight rolls easily in this configuration and should not be used, ever, for any reason. Flat figure eight: This knot has been confused with the flat overhand an has caused accidents. Simul-rappelling with two climbers at the same time on either side of the rope. A correctly tied flat overhand knot would hold the two climbers’ weight, provided they don’t shockload the anchor – for me, this would take the load too close to the limit of the knot and I would use a different knot when simul-rappelling. In situations where the rappelling climber may have to tie off during the rappel and climb with the rappel rope as protection against a fall – such as if the climber rappelled past the next anchor and climbed upwards, building up a loop of slack in the system that could result in a shock load. If a rappel is converted to a top rope where unusual forces could occur during the top rope, such as if an ice climber was to break a large icicle across the rope or a rock climber was to build up slack and take a longer fall onto the rope. While the flat overhand tests plenty strong enough to hold a body weight top rope fall, other knots are stronger and better suited for top rope use. If rappelling with huge haul bags. A rescue scenario with more than one person or a mechanical advantage system on the rappel ropes. Rappelling in spindrift avalanche conditions where a small avalanche hitting the climber could dramatically increase the force on the ropes. Flat overhand: Reliable knot for trying rope ends together when tied properly. Be sure the tails are at least 1 foot or 30cm long. Tie the knot neatly, with no twists within the knot. Each of the 4 strands emerging from the knot must be, individually, pulled tightly to remove all slack from the knot. In Advanced Rock Climbing: Expert Skills and Technique, on P. 94, I wrote a warning about the flat overhand that is incorrect. I was on deadline when I heard of the accident in Austria, and I made the mistake of warning against using the knot without having all the details, then I wrote a blog post that further spread the mistake. I suppose it was better to post a warning that wasn’t necessary than to include a knot that is not reliable, but the best of course would have been to have this information before the book was published and include this information in the book. It will be updated in the next printing. My apologies for the mistake. I hope that the upside of my mistake is that more climbers better understand the limitations of the flat overhand knot. ORIGINAL POST BELOW IN ITALICS - THE BARREL KNOT IS A GOOD OPTION, BUT THE FLAT OVERHAND IS A RELIABLE KNOT WHEN USED WITHIN ITS LIMITATIONS. The ideal knot for tying two ropes together for rappel has been a point of controversy in recent years. In my recent book, Advanced Rock Climbing: Expert Skills and Techniques, I took a firm stand on the latest evolution of the ideal rappel knot. This has become a point of confusion, because the newest technique, a double-strand variation on the barrel knot, is not shown in the standard online knot-tying resources and is not yet widely used. See the end of this post for the barrel knot tying sequence. The barrel knot: the new gold standard for trying ropes together? In Advanced Rock Climbing, I explain under no uncertain terms that the flat overhand, a knot often called the Euro Death Knot should not be used to tie to ropes together. This appears to contradict many previous publications, online and print, that describe the flat overhand as a perfectly safe knot when tied correctly – snugging each of the four strands tightly, tied neatly, and with a tail at least one foot, 30cm or 12 inches long. Thousands of tests have shown that the flat overhand is a reliable knot - when tied correctly, tightly, neatly and with a long tail. This is not in question. What is in question is this: should a knot that has such a fine line between holding and failure be a standard climbing knot? What about when the wind is howling, in the dark, the ropes are frozen, and we’re wearing gloves over frozen fingers and have been climbing for 24 hours? Climbing does not happen in a laboratory, and this is why I have taken the stand in Advanced Climbing that the flat overhand is a dangerous knot. While writing Advanced Rock Climbing, I interviewed 15 superstar climbers and guides, including Marc Piché, the Technical Director of the Association of Canadian Mountain Guides (ACMG). He told me that the ACMG is now suggesting guides only use the flat overhand with extreme caution, or, even better, tie a new knot the ACMG instructors are calling the barrel knot that has the advantages of the flat overhand without the risk. This change is largely due to a recent high profile accident where an Austrian climber was killed during a guide training when the flat overhand failed. Climbing technique is always evolving. 40 years ago, the standard tie in knot was the bowline, single or double. Some climbers still use the basic bowline as a tie in, and swear by it, but the knot has also come untied, causing several bad accidents. As the standard tie in, the bowline has been replaced by the figure eight rethread, largely because the figure eight is more forgiving to tie securely; even tied loosely or without the rope threaded through the last pass, the figure eight still tests to nearly full strength. The bowline rethread is also proving to be reliable tie in knot, without the fickle nature of the standard single or double bowline. When I first heard of the flat overhand, I conducted a little experiment. Tying the knot in dental floss, it would easily roll and fail when pulled, but when I tied a single overhand in one of the tails, the knot would stop against the overhand and the floss would break before the knot failed. Of course, dental floss has different characteristics than climbing rope, but it was enough to convince me I didn’t really trust the flat overhand alone. I have used the flat overhand myself for many years, but due to my dental floss experiments, I always tied a single overhand in one strand and snugged it up against the knot as a backup. Online information shows the barrel knot in several different forms. One is tied in a single strand, and in its single strand form is already a common climbing technique as a stopper knot tied in the rope end to prevent rappelling or lowering off the end of the rope. The other version shown online is what climbers call the double fisherman's. In either case, the rappel version of the knot is very similar in form, but tied with both strands in parallel and the ends protruding from the knot at the same point, just like a flat overhand. Tying the barrel knot in two rope ends together results in a knot that has the same advantages as the flat overhand (pulls over edges easier and is quick and simple to tie) without the finicky nature and tendency to fail. The barrel knot is tied much like to the flat overhand, but with a full extra wrap around the rope before the tails are passed through the knot. This is also similar to the way the grapevine or double fisherman’s is tied, but the barrel knot is done with both strands in parallel. Many people will continue to use the flat overhand safely, but my goal in replacing it with the barrel knot in my cutting-edge book on advanced climbing technique is to help move climbing method forward and remove the flat overhand from standard climbing technique as quickly as possible. For you as an individual, the flat overhand may be just fine, but for a thousand climbers to tie a thousand times in a thousand different rappel situations, the barrel knot is safer and it is my prediction that in the next few years the barrel knot will almost entirely replace the flat overhand as the guiding and recreational climbing standard. 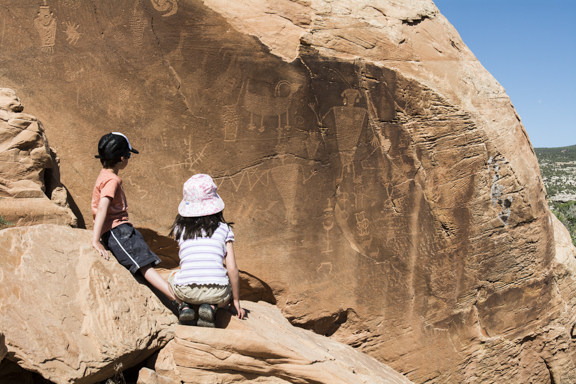 6-year-olds pondering somewhat older artwork in Dinosaur National Monument. Horseback riding in the Great Sand Dunes, Colorado. Rock climbing, Rocky Mountain National Park. 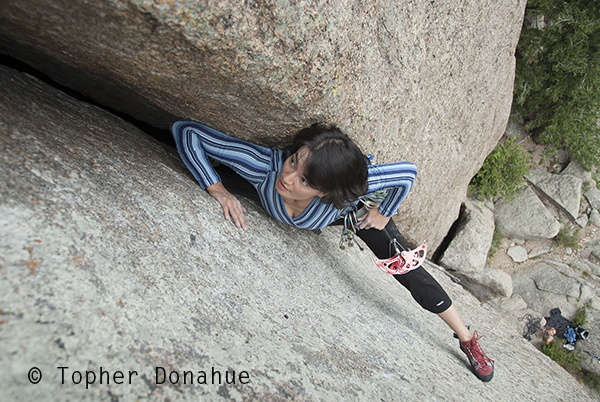 Crossing a tyrolean traverse in the Indian Peaks. Ice climbing on the Diamond, Longs Peak.